Economic Development policy is a complex tension of ideas, inputs, outcomes, morals and ethics. Approaching this tension without honesty and authenticity will not produce outcomes that are honest and authentic - or ultimately effective for the place. We look at each Economic Development project as a unique set of conditions and context so that we are providing effective and place-based solutions, not a standard formula that may not be appropriate. Our view of Stewardship gives us an obligation to work toward practical, pragmatic solutions to real problems through honest evaluation and analysis. We believe firmly that treating all people with dignity and respect and that listening more than speaking can contribute to the best outcomes. 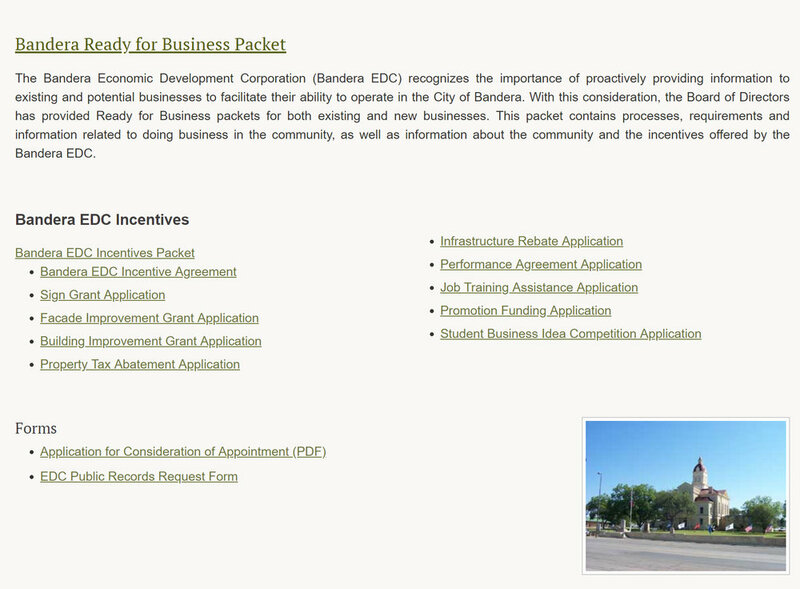 We provided an update to the bylaws, a policies and procedures manual, a business-ready packet and an incentives package for the Bandera, Texas Economic Development Corporation. We are also providing an economic impact assessment of the historic Mansfield Park rodeo grounds (owned by Bandera County) on Bandera County to the BEDC and the Bandera County Commissioner’s Court.